Dan- Salisbury Serenity - The location is convenient, close to ski resort and sledding park. The house is spacious, clean and well equipped. Very family friendly. Our family had a great time staying here. Tony- Cedar Flat Bear Tracks - Great cozy cabin, perfect for two families with kids. Great location close to Garwoods! Not far from Tahoe City! Matias - Kingswood Village #163 -Great spot, nearby Kings beach, the house is lovely and full of amenities, very clean, lovely view to the woods. 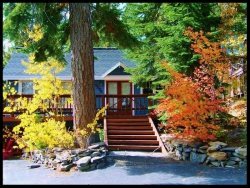 Chandler - Cedar Crest - Perfect cabin for a Tahoe weekend! It's in a cute quiet neighborhood about a 20-30 min drive from Squaw, and right near shops and grocery stores. Great kitchen, nice fireplace, comfortable beds, enough parking for 4 cars. Our host made everything easy for us. We had a great time, and would come back! Alexandra - Dancing Bear - Beautiful setting right off the lake, extremely comfortable beds and bedding, clean and cosy cabin, really feels like a family home-away-from-home, and also conveniently located to shops, skiing, ice skating, etc. Well worth it and would love to stay here again! Victor - Kingswood Village #8 - Great home - very comfortable, strategically located very close to Northstar, 4 beds and 1 coach that can be used for sleeping, too. Nidhi - Dollar Point Harmony - Overall all it was a good experience. As we were out most of the time, didn't use any of kitchen amenities. but i could see it has all the things required for a stay. I was very happy to see lots of games and outdoor activity material sitting there to use. overall good experience. Brandon - Dog Friendly Cabin - Had an amazing time at this cozy little home, jacuzzi was relaxing and it felt very nice to be so close to everything. I would defiantly return! Joanne - Dollar Hill II #84 - The house was great! The pictures were accurate, the place was very clean and plenty of room. The amenities were as described, hot tub, pool, a grill, board games, small book and DVD collection. Quick to respond with my questions even though I booked last minute. The arrival was easy no hassle. Leota - Kingswood Village #191 - I was able to call the host to make sure I knew how to get to where I was going. The place was clean and as advertised...Really a great experience! Felt super safe in the area...the area is just beautiful! Matthew - Cedar Crest - Everything was exactly as advertised. It's tucked into a wooded neighborhood street just a few minutes from Tahoe City, and 15 minutes from Squaw Valley. Couldn't have asked for anything better. Communication was swift and nothing was left to chance. Highly recommend for anyone looking to stay in the area. Angel - Lake Forest Glen #217 - Great location for family with a dog and toddler. Close to pools, playground, and walking distance to a nice beach. Short drive to shops and restaurants in Tahoe City. Clean and all home necessities provided- even a baby/dog gate for stairs. Debbie was very responsive and all necessary details were provided well in advance. Was worried about lack of reviews, but it seems to be a managed vacation rental- procedures standard and organized. It was just what we needed for a nearby conference and lovely getaway. Chase - Lake Forest Glen #217- Great little condo complex close to everything in Tahoe City! Kids loved the pool and the condo is really close to it. Also good access to the lake as well as the main walking trail. Condo itself was clean. It was perfect for a couple of nights. Debbie was easy to communicate with. Really great stay! Ramon - Dog Friendly Cabin - Had a great experience. The place was comfortable, close to Squaw Valley ski resort, where we did the Spartan Beast race. Couldn't have asked for more. If I was to go to Lake Tahoe again, I'd definitely look into staying at Debbie's place. Everything was clean and in order. Deb Dog Friendly Cabin - We had a great weekend stay. The house was conveniently located, clean, well decorated--exactly as expected. Would stay again without hesitation. Jen Ernst Lakefront - Everything was great. Home was clean and as was described in web-site. The team provided fast turn around considering fact that we was looking home for super busy period of time, at New Year. Andreay Dog Friendly Cabin - We enjoyed our stay. The location was good, and the rental was comfortable. Dennis - Lake Forest Glen #217 - The condo was great and had plenty of room for two couples. The pool is super convenient (2 options) and the location is a 15 min walk to the beach at dollar point. Had a tricky time connecting to the wifi (password was incorrect in the booklet) but we figured it out and it worked beautifully. Debbie responded quickly by phone and message to any questions and was even flexible with check in time. Would recommend and would stay again! Diva Lake Forest #190 - Great customer service! EA Dog Friendly Cabin - Great property - allowed my pup, hot tub, nice furnishings and well supplied. Will be back in the summer to enjoy the private beach :). Can't wait to come back again - and will definitely tell our friends. Debbie was really helpful. JG Kingswood Village #172 - It was nice and the location was perfect for our needs. Only having one bathroom on the bottom floor was a bit inconvenient but other than that it was a very nice condo. Nat -Kingswood Village #191 - Great space, clean well prepared, helpful with wifi. Would totally recommend and will rent again. Easy great accommodations and amenities. Angela - Dog Friendly Cabin - We enjoyed every minute of our stay! The cabin was great and had everything we could ever need. The cabin is in a convenient location to restaurants, shops and grocery stores in Tahoe City. Having access to the HOA beach was a bonus and the beach wasn't overcrowded and had lots of great amenities like picnic tables, BBQ grills and horseshoe pits and the walk from the cabin to the HOA beach was easy and quick! It was also great to be able to come back and relax in the cabin's hot tub! Also loved that the cabin is dog friendly! Only downside was that the HOA beach doesn't allow dogs, something to keep in mind if you're not willing to explore other beaches in the area. There are dog friendly beaches a short drive away so it ended up not being an issue for us. Overall, fantastic place to stay! Debbie was great and answered any questions we had before our trip and while we were there right away! We're already trying to find a time to book here again!!! Fizzy3 Kingswood Village #163 - We have rented this condo 12 years and it is just perfect for us. Christine Lake Forest #217 - We have always enjoyed renting through Stay in Lake Tahoe and this is the 4th time we have rented this particular unit in Lake Forest Glen. Stacey Hot Tub Hideaway - The Hot Tub Hideaway cabin was perfect for us. It has lots of different sleeping options, the hot tub was well- used. We went to the community pool a couple of times and had a great time catching crayfish at the pier (a family tradition of ours). This property easily met our every need and desire! Beth Mammoth Getaway - We had an amazing time. The home was wonderful -clean and fully stocked (far more than was expected!!). Access to the private beach was a HUGE bonus!! We hope to be coming back again! Tahoe Awesome Rooney's Roost - It was an awesome experience. We will absolutely do it again. The house was great and the customer service was impeccable. Alison Salisbury Serenity - This house is spacious and lovely, perfect for big groups. The kitchen is big and well equipped, so was perfect for cooking a big meal together. Plenty of beds and bathrooms, and a lovely living room with a working fireplace (BYO wood). It is central to several ski areas, and the town of Kings Beach has a few cute restaurants and a Safeway. We ended up not being able to ski due to high winds, but there were plenty of other activities to do in the area. I would definitely go back! Elizabeth Lake Forest Glen #44 - Quiet townhouse with good access to Squaw/Alpine and Northstar ski resorts. Kitchen is well equipped and the place comfortably sleeps 3 couples. Good value for those looking for a place to sleep and gather as a group for a ski weekend.